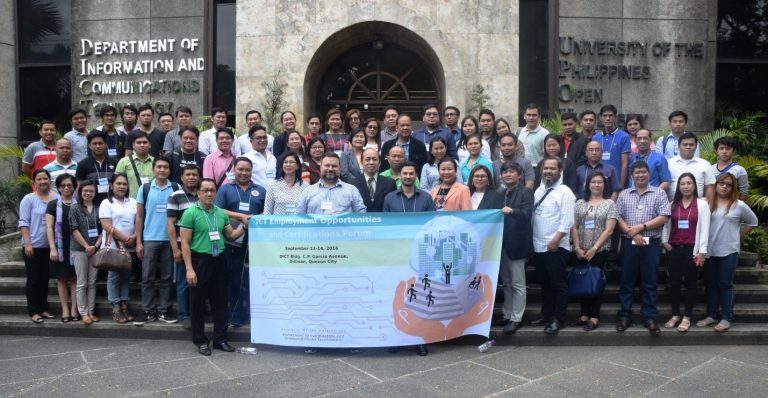 Aimed at strengthening partnerships with academic institutions from both the government and the private higher education institutes (HEIs), the DICT’s National ICT Competency Management (NCM) Service held a two-day forum on September 13 – 14, 2016. Aptly themed “ICT Employment Opportunities and Certifications Forum,” the event paved way for presentations which covered information, infrastructure, certifications, and partnerships. Highly experienced speakers and partners from the International Telecommunications Union (ITU), International Computer Driving License (ICDL) – Asia, Cisco Philippines, Information Systems Audit and Control Association (ISACA), and the Commission on Higher Education (CHED) graced the two-day forum. The forum’s highlights include a discussion session and preliminary networking among State Universities and Colleges (SUCs) and private HEIs across the Philippines. They were grouped according to the DICT’s FOO Clusters, wherein the Cluster Directors facilitated the discussions. Outputs from the discussions included an identification of challenges being faced by the SUCs like lack in resources and the need for standardized training content that are to be rolled-out in the provinces. Networking and partnerships were seen as among the best solutions to augment the challenges raised. SUC representatives will be coordinating with their respective heads of schools for future collaboration and synergizing of efforts with the DICT in delivering ICT knowledge especially to the marginalized and at the grassroots level.